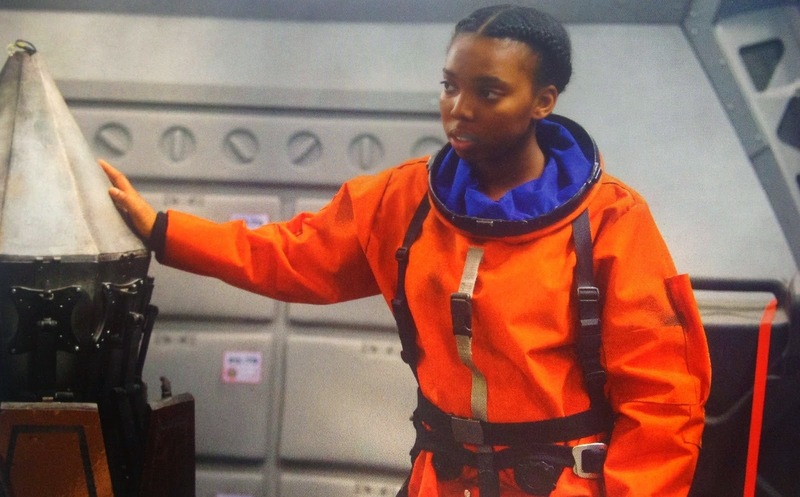 Despite having one of the silliest titles in recent memory and a premise which, at least initially, seems uninspiring, "Kill The Moon" wound up being one of the most compelling and confrontational episodes that Doctor Who has produced. What looked at first to be a fairly blatant Aliens rip-off (a comparison that wasn't helped by BBC America airing commercials for Alien: Isolation during the breaks) shifted on a dime to become a provocative chamber piece and morality play, then shifted again at the last second to question the very nature of The Doctor himself. If nothing else, it made for a surprising 45 minutes. Now, about that premise: Having met and got along swimmingly with Courtney Wood (Ellis George), one of Clara's more troublesome students, last week, going so far as to take her into space in the TARDIS (an experience that left her feeling more than a little queasy), The Doctor decides to take her on another expedition. This is a set-up that the show has done several times before; someone from a Companions' life discovers who The Doctor is, so they have to be included in at least one of their adventures. The writers even used nearly the exact same set-up for the Neil Gaiman-penned "Nightmare in Silver", which also saw The Doctor and Clara take a child (well, children) in her care on an adventure that features space insects. That familiarity is what makes the episode seem so unpromising, even if it has a few interesting wrinkles. They go to the moon in the year 2049, only to discover that a crew of astronauts led by Lundvik (Hermione Norris) are already there ahead of them, and that the moon's gravity has become almost Earth-like. The moon has been putting on weight, and Lundvik's team have been sent up to investigate what is causing such marked shifts in the moon's composition, as well as to discover the fate of a group of Mexican astronauts who vanished ten years earlier. Unsurprisingly, things did not go well for the Mexican crew, and they only go slightly better for Lundvik's. It's here that the episode most strongly shows the influence of Aliens on its storytelling, since not only do they find some of the lost astronauts effectively cocooned in an abandoned building, but the creatures that killed them are giant spider-like creatures that are only just legally distinct enough not to be called Facehuggers. Most of this year's Doctor Who episodes have worn their influences on their sleeve, but by the time it reaches the scene where Courtney is trapped in a small room with one of the creatures and The Doctor is frantically trying to break through the glass to help her, "Kill the Moon" might as well be wearing a Ripley and Newt T-shirt. That's not to say that the first half of the episode wasn't interesting. The cold open, in which Clara is shown making an impassioned plea to the people of Earth to make a choice between "An innocent life versus the future of all mankind" made for a bold start, and even if the Aliens-derived scares were distractingly obvious, they were undeniably effective. Much like last week's episode, this one made good use of shadows to hide the limitations of the budget; its monsters were only partially glimpsed, and were all the creepier for it. The limited number of characters - a number which depreciated rapidly as the creatures started picking people off - also helped create a really claustrophobic vibe even before death started stalking them. The opening half of the episode was dark, creepy and mysterious, and if it had continued in that vein it would have made for another strong episode. The revelation at more or less the halfway point that the creatures were not insects but germs, and that they had appeared on the moon because it is actually an egg that is about to hatch, took the episode in an entirely new and unexpected direction. The revelation itself seems like something that could have been very silly, and it kind of is, but the actors and the script (written by Who newcomer Peter Harness, who previously wrote the very sweet Michael Caine dramedy Is Anybody There? and has written the forthcoming BBC adaptation of Susanna Clarke's great dueling magicians novel Jonathan Strange & Mr. Norrell) treated it with a moral seriousness that really elevated the premise. Realising that allowing the moon to hatch could completely devastate the Earth, The Doctor, Clara, Courtney and Lundvik are faced with a choice; to allow the creature to live, or use nuclear weapons to kill it before it gets the chance. Actually, The Doctor isn't faced with that choice because he recuses himself from the decision-making process. Saying that it isn't his moon or his planet, he leaves it up to the three women to decide if the unborn creature lives or dies, with the fate of Humanity hanging in the balance. (To increase the stakes, The Doctor reveals that he conveniently doesn't know for certain what actually happens at that point in history, so he couldn't offer them any guidance even if he wanted to.) So having placed these three characters in a series of small rooms, the episode slows down and has them discuss the moral implications of carrying out an abortion on a huge scale. The word "abortion" may never be said by any of the characters - the closest it gets is the moment when Clara deactivates the nuclear weapon and the word "ABORTED" briefly appears - but the episode is undoubtedly about one, even if it may not be about the broader debate about a woman's right to choose. It's worth noting, particularly for American viewers, that abortion is not a hot button topic in Britain the way that it is in America; individuals may have strong personal, moral or religious opposition to it, but there is no large-scale political movement to restrict access to abortion clinics, or calls for abortion to be banned entirely. As such, I think the decision to centre "Kill The Moon" on a debate about whether to kill an unborn creature has less to do with making a big political or social statement (because it would be making one on a debate that doesn't exist in its home country) than it does with placing Clara in a position where she has to make a difficult decision. Because ultimately, "Kill The Moon" is about pushing Clara's relationship with The Doctor to its breaking point. After putting the moon's fate to the people of Earth - asking them to turn off their lights if they think the creature should die or leave them on if it should be allowed to live - and negating that decision when Clara turns the nuclear device off, The Doctor returns to take Clara, Courtney and Lundvik back to Earth where they witness the birth of the creature. As it unfolds and floats away, The Doctor makes an impassioned speech about how viewing something so magnificent was the crucial event that led humanity to rediscover its desire to explore the Universe, and to endure until the end of time. (Incidentally, that speech, as well as the way that Peter Capaldi imbued the words "The moon's an egg" with such a potent mix of glee and fear, made this probably his strongest episode to date.) Yet heartfelt speeches don't mean much when they come after you've abandoned, both physically and emotionally, someone who admires and respects you, and when they get a few moments alone in the TARDIS together, Clara lets The Doctor have it. Clara's rebuke to The Doctor is truly an astonishing moment, and one of the best scenes that Jenna Coleman has had since she joined the show. It's the deepest the show has ever explored the relationship between not only The Doctor and his Companions, but also his relationship with humanity in general; the way that he sets himself up as a protector while remaining separate from those he protects. He abdicates responsibility from making a decision in order to respect Clara's choice (at least, that's how he frames it after the fact), but he also abandons her and leaves her to face a terrible situation more or less alone. That she ultimately made the right choice is immaterial when placed against the betrayal that went into that decision. In terms of character development, it really feels like a quantum leap forward for Clara, and hopefully represents something that the show can build on. Given how the episode ends, with Clara angrily leaving the TARDIS seemingly hellbent on cutting herself off from The Doctor, the show will have to reckon with the aftermath of that scene. It certainly feels as if the writers have forced themselves into a position where they have to rethink how The Doctor relates to the people around him, something which the series has been consciously moving towards by making Capaldi's take on the character so imperious, arrogant and difficult. After years of the show struggling to make its big narrative arcs work, I'm thrilled that the big story this year seems to be rooted almost solely in the characters, and that the show is using such a huge canvas to explore its relationships. "Kill The Moon" was one of the boldest episodes of Doctor Who, and one that rivals "Listen" in its potential to attain future classic status. - I was pleased to see the episode directly bring up the "killing Hitler" question when considering the implications of killing the moon creature. It's a story type that the show has explored before - most notably in the classic Tom Baker serial "Genesis of the Daleks", in which The Doctor is given the opportunity to destroy the Daleks before they were created but ultimately decides not to - but this feels like one of the most emotionally powerful iterations of it. - Not to dwell too much on the abortion subtext, but it's certainly interesting that the show had the central debate take place between three women. I'm on the fence about whether or not that was a smart choice on the part of the writers, or an incredibly cheap one that heightened the emotions of the scene artificially. - Having the moon "put on weight" so that it has more Earth-like gravity is certainly a novel way of getting past the need to recreate the moon's lower gravity. - "You can not blame a baby for kicking." Jenna Coleman really was spectacular in this episode.